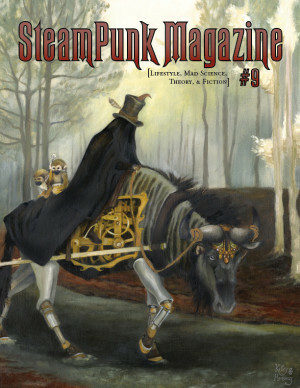 Steampunk Magazine » SteamPunk At DragonCon! DragonCon, which is a mighty-big-deal convention in Georgia, will be host to a great deal of wonderful steampunkiness. SteamPunk Magazine is sponsoring our friends and contributors in Ego Likeness at the event, who will be tabling the magazine and the newly-reprinted Guide to the Apocalypse. [Note that Ego Likeness is not a steampunk band, but is composed of regular contributors of art and literature to our publication]. Also playing are steampunk mainstays Abney Park, as well as favorites Voltaire and The Hellblinki Sextet. I’ve seen all these acts live and recommend each. I didn’t get to see the other acts, but I did get to see Abney Park!